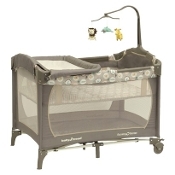 Our Pack N Play Nursery Center is our regular Pack N Play with more. It includes a full bassinet, changing table and a toy mobile. We also provide 1 pad and 1 sheet. It is portable from room to room on the 2 locking wheels. Great for children up to 30lbs. Styles and colors may vary. Measures 38" x 27"